This MEDIUM double-sided brass pushrod plunger is a direct replacement to your damaged pushrod plunger. This is the THIRD largest pushrod in the complete set. (Please see listing photos for reference to make sure that you are ordering the correct size pushrod that you need). Irreparable damage occurs when a brass pushrod is pressed too far down the Swedish Wrap Dies and makes contact with the inner die side walls. This can mainly be avoided by using an arbor press over a hydraulic press; as the arbor press provides a nice balance between power and feel. Each pushrod plunger in the set is double-sided, giving you the most options by offering the most sizes available for extruding con rings than any other pushrod plunger on the market. 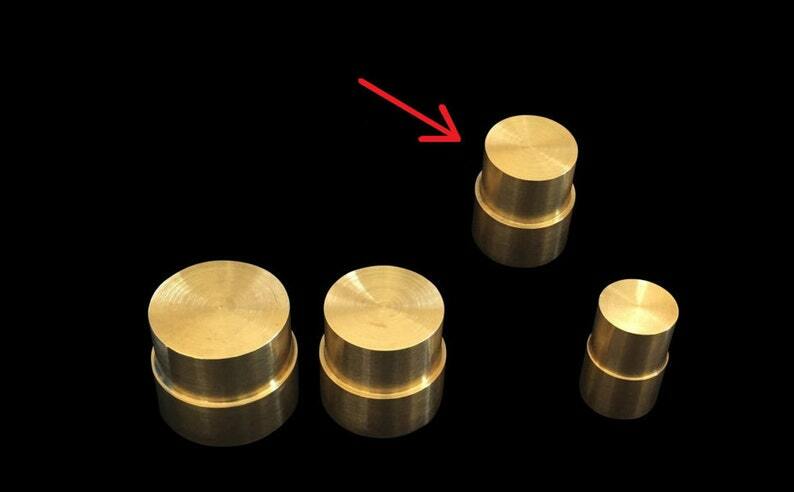 The brass used is produced here in the USA and each piece is CNC-machined by skilled machinists to the most exact tolerances and finish-sanded by hand for the best possible quality and results. 1.) Make sure that you firmly press the teflon-wrapped coin ring to make sure that it is seated evenly into the die before compressing with the brass push rod plungers. 2.) Press SLOWLY and make sure that the brass pushrod plunger covers the majority of the reeded portion of the coin. If it doesn’t cover enough of the reeds, the push rod plunger could slip as you are compressing it, possibly ruining the coin ring. You can fix this issue by placing the coin ring, (reeded side DOWN) into either your Universal 17°, 20°, or 25° reduction die to slightly shrink the outer diameter of the reeded side until the brass push rod better covers the reeds. 3.) Make sure that you don't over-press the brass push rod plungers down the Swedish Wrap dies, especially when using a hydraulic press. After some practice, you’ll feel the resistance of when each push rod bottoms out in the dies. 2.) The level of quality of my tools is simply not duplicated elsewhere; as I use the highest quality materials that are precision CNC-machined to the finest standards by expert machinists. 3.) My customers always come first! I can always be reached through Etsy, by e-mail directly, or by leaving me a comment on my blog site. 4.) I have a passion for both making coin rings as well as creating the highest quality coin ring-making tools on the market today. That's why I've created a platform where people can go to get their questions answered about all things coin rings; as well as ask questions and even leave suggestions. Please visit my new blog site at: CoinRingBlog.com for coin ring making tips, tricks, and tool updates. 6.) Why settle for buying inferior coin ring tools elsewhere? Buy from CoinRingUSA® and get the best in quality and craftsmanship! Good quality machined brass. Delivered as anticipated. Again a replacement for the original and will be more careful with it.